The past month and a half has been amazing, and tiring, and inspiring, and hard, and full, and I just wanted to share a few thoughts about it. #MoreStoriesMonday will highlight and share stories from people who are impacted in different ways by mental health struggles and the realities of our broken mental health system. I begin all of my talks by saying that my story is not a universal story, and that in many ways I carry a privileged voice in the conversation about mental health. #MoreStoriesMonday will focus on voices that carry less privilege and less visibility than mine. There's a huge need to listen to the voices of people impacted by mental health challenges whose stories aren't often heard, and his is how I will respond that that need. "In the beginning, before words, there was the Word, and the Word was Love. 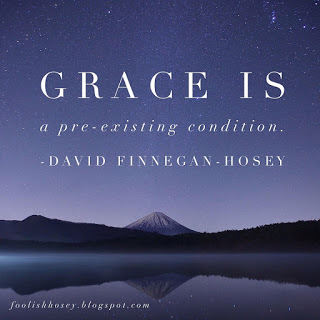 Grace is a preexisting condition." Much like my first book, it will interweave threads of personal experience, theological reflection, and ministry practice. But rather than focusing only on the personal or interior experience of mental illness and mental health struggle, it will focus on the public conversation around the mental health system and access to care. It will ask the question: what does it look like to think in a more healthy manner -- to think healthier theologically, personally, and practically -- about mental health care? There's a huge need, as we continue to challenge stigma and break the silence, to connect personal stories to the systems that keep people silent and sick, and this is how I am going to respond to that need.